ISEE opened the TIO-sponsored workshop and introduced the participants to the workshop’s purpose, agenda, and to the development of the future TIO international training program. This workshop is just the first step in developing a program that will serve the TMT partnership by developing a global community of future leaders. The workshop will orient participants to TMT, and focuses on skills valued by TMT. 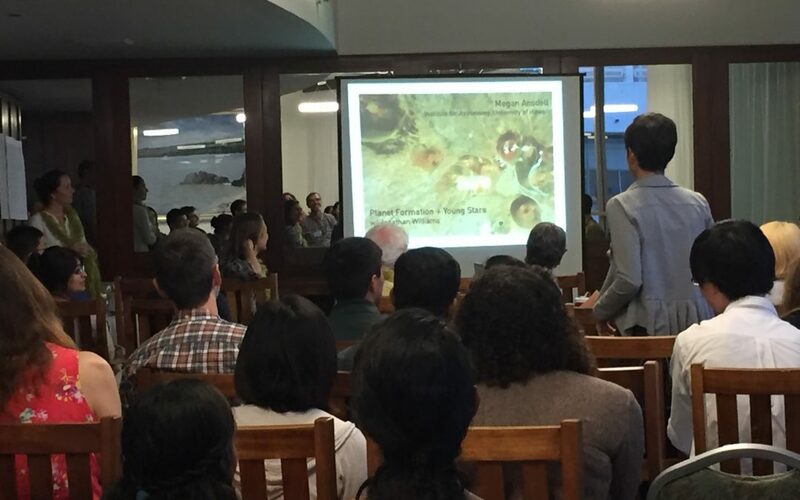 Throughout the workshop, participants will give input on the design of a future program, making this a unique opportunity for participants be part of the development process. *TIO is a company, the Thirty Meter Telescope International Observatory – it is comprised of all the partners in TMT. TMT will be the physical observatory. However, they are often used interchangeably. 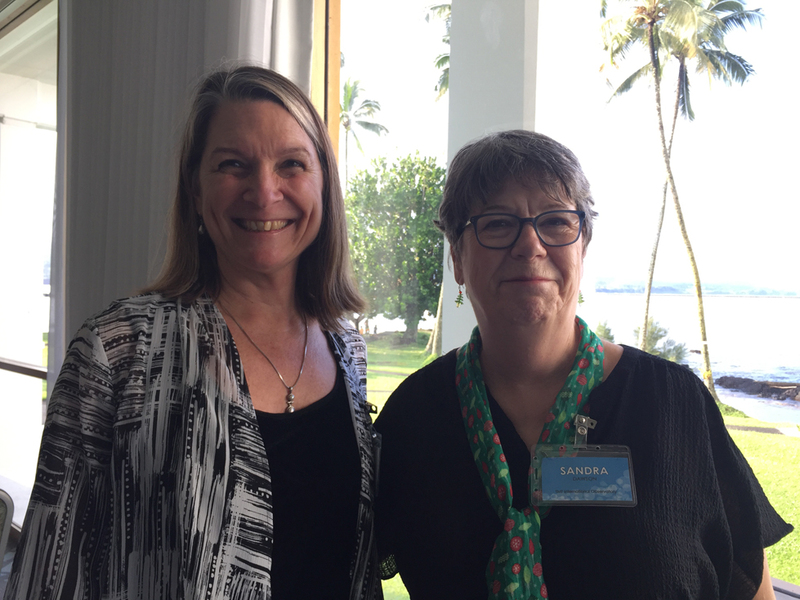 Lisa Hunter and Sandra Dawson came up with the idea for an international program about two years ago. Lisa Hunter with Sandra Dawson. Lisa began the workshop by sharing ISEE’s long history of partnering with telescopes. She discussed the Akamai program, established in 2003, which places college students at telescopes and high tech companies for summer projects in Hawaii (see: Akamai Workforce Initiative). 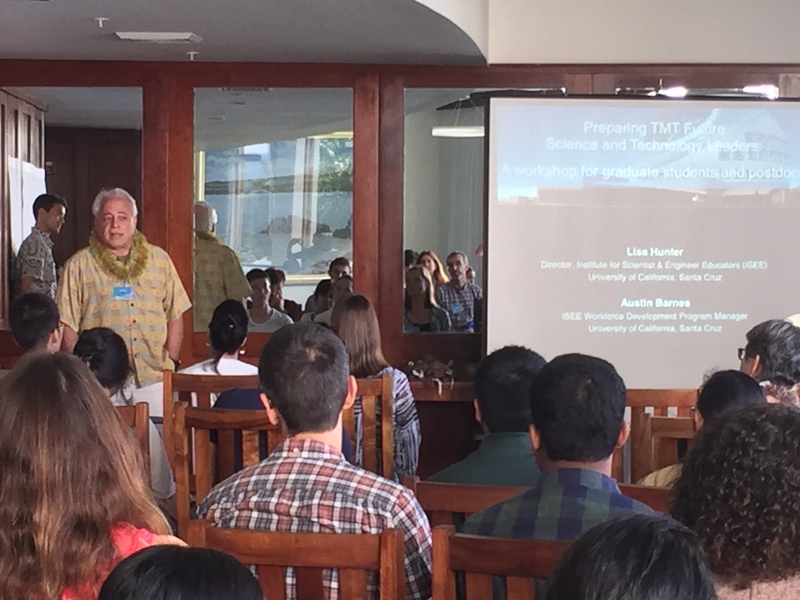 TIO has become the cornerstone funder of Akamai, and along with all of the major telescopes on Maunakea who mentor summer interns, has demonstrated the value of telescopes to the community. Throughout her presentation, she emphasized the importance of well-designed workforce development programs, and gave kudos to TMT for the attention and resources they are dedicating to training people. Sandra welcomed the group to the workshop and expressed how delighted she is to see the workshop get started. 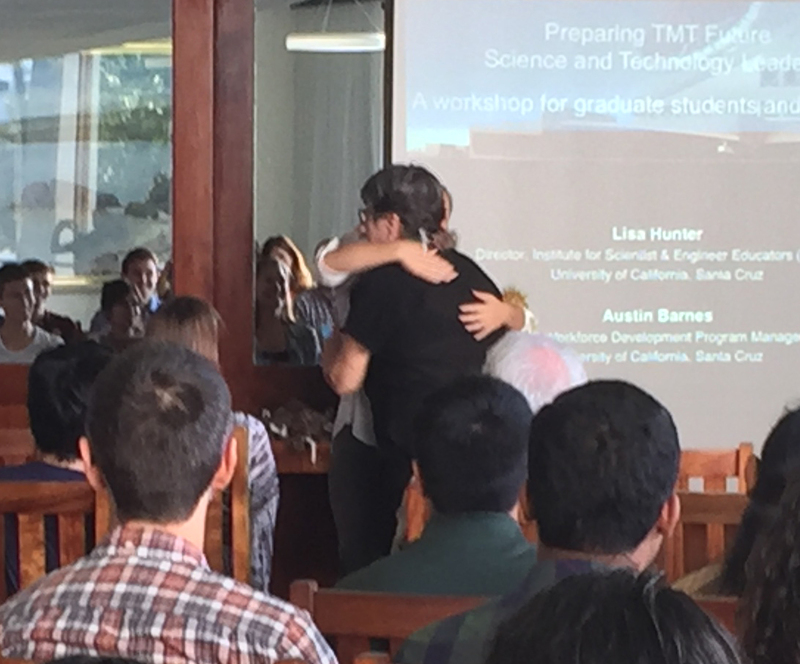 She has been inspired by the enthusiasm for TMT expressed by young people from around the world, including a group of high school students participating in a TIO program a few years ago. Sandra contacted Lisa in 2008 about the Akamai program, helped get it funded by TIO, and has been a supporter ever since. In Hawaii when you greet someone, you give them a hug. That’s just the way it is. Come here, let me show you. I can’t tell you how many times I’ve given hugs to shocked people, but that is just the way it is here in Hawaii. Gary Sanders, TMT Project Manager, was immediately supportive of this workshop and was the first to volunteer to be an instructor. Gary Sanders welcomed participants to the workshop, and emphasized that most traditional education does not yet provide adequate preparation for today’s jobs, especially in the case of a large project, such as TIO, Workforce development is a high priority for TIO, and Gary quickly approved funding for bringing graduate students and postdocs from throughout the partnership to the workshop, and encouraged key leaders within TIO to also serve as instructors. 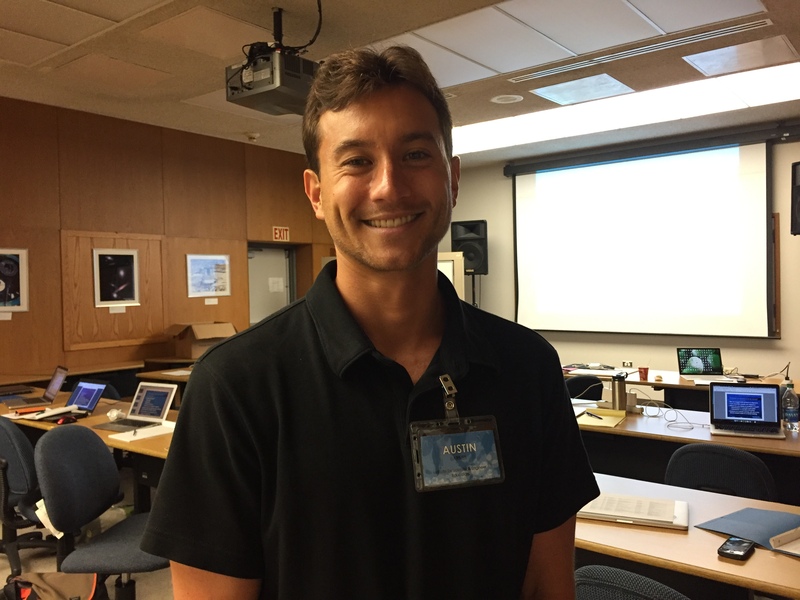 Austin Barnes, an ISEE Program Manager, took the lead in designing the workshop. Austin Barnes, ISEE’s STEM Workforce Development and Education Manager, spoke with the group about the present and future goals of the program, emphasizing that this workshop is a pilot for the preliminary design. A potential future program is being designed to overcome some challenges inherent in a large, multinational project such as TMT. One such challenge is matching the right person with the right TMT project, and a future program design will make sure to leverage ISEE’s experience and expertise to do so. Getting it right is mutually beneficial. The potential future program design is based on giving opportunities for in-person interactions between participants and TIO leaders, so that larger investments in resources are not made without more careful matching. The proposed two-week summer school is designed to overcome the limitations of a simple visit. In fact, visits are unlikely to naturally happen at the level desired by TIO, especially visits without additional support. Participants in the workshop are asked to give input and feedback. This workshop is a preliminary design. This 4 1/2 day workshop is a pilot for the summer school. They are looking for feedback!